As if they heard my SOS call, Premier Clinic invited me to try out one of their aesthetic treatment services and that made me jump with happiness. They have two branches at the moment, one in Taman Tun Dr Ismail (TTDI) and the other one is located in Bangsar. Luckily, my office is located near the Bangsar branch, so I decided to give it ago. Why not right? Premier Clinic Bangsar is located on Jalan Telawi; right next to Raj Banana Leaf Restaurant and is on the same row with Bangsar Post Office. When I arrived, I was greeted by the receptionist and proceeded to fill my details on their registration form. A few minuted after that, my name was called and I entered the consultation room. Very quick and no fuss at all. After saying hello to Dr. Aarthi Maria who was the one in charge for my treatment consultation, the discussion on my treatment started. I chose to experience one of their weight loss treatment, so Dr. Aarthi recommended me to try out their Vanquish Fat Reduction facility. What is Vanquish Fat Reduction? 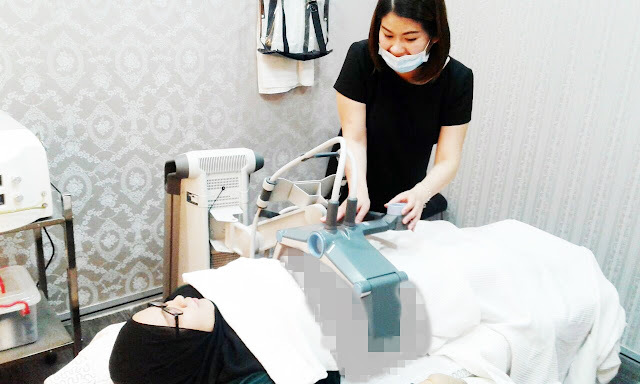 According to their website, Vanquish is a new, non-invasive fat removal and fat elimination treatment that uses safe radiofrequency (RF) technology to destroy unwanted fat cells. Suitable for both males and females, each session lasted for about 30 minutes and they are typically done up to eight treatments. According to clinical test, this technology has proven its ability to decrease belly fat by two or more inches. It is also able to eliminate up to 59% of the targeted fat cells. The treatment only targets your fat cells and it doesn't affect surrounding tissue. No anesthesia is required for this. Destroyed cells will then be naturally eliminated by your body system. The optimum result can be within 2-3 months after the last session. Soon after consultation, I was shown to the treatment room. My treatment consultant then started gathering all the necessary data which includes weight, body fat index and measurement of my tummy including the upper, middle and bottom area. My treatment started soon after everything was done. I was asked to lay down on the treatment bed and the machine was then set up so the process can be started. The treatment session was quick and painless as the machine won't touch your skin. But a tinge of warmth (a comfortable one I would say) can be felt on your skin. It's so comfortable that I managed to take a quick nap while doing the treatment. LOL. You will also be given a portable caller device so you can ring them up if you need any assistance during the treatment. Address: 40 Jalan Telawi, Bangsar Baru, 59100, Kuala Lumpur. *Same row as post office and next to Raj Banana Leaf Mamak Restaurant. I tried this treatment 2 years back and it is really effective. However, you need to maintain your body well by exercise and eat clean of course. Woahh. You did the complete one is it? I was pondering about that one you did though. But decided to go for weight lost. I tried this treatment before!!! Really effective for me!!! This looks like a nice treatment and did you manage to take all the sessions. This is my very first time know about this treatment. Will recommend to my cousie about this beauty treatment. wow you did it as well.. so did i. and it works!! This post reminds me that I so desperately need this kind of a treatment. How are the results in the long term? Wah I need this treatment, I cant wear cropped top coz got fats around my stomach area. Is there any side effect with this method? That is one thing I am concerned about. Although the RF level is low, but is there other type of risks involved or any precautions to be done before this treatment? Hi Rodger :) From the treatment info cited from premier clinic website, "It also has less side effects compared to other procedures while removing more fat per session in comparison with other non-invasive fat reduction techniques." Personally, it's been about a month since I did the treatment and as far as I'm concerned, I haven't experience any discomfort :) But it's best to consult a physician there first before proceeding to any treatment as personal health background need to be considered too. Hope this helps!